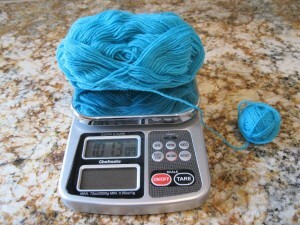 I find it easiest to wind the entire ball of yarn first, and then set the cake of yarn onto the scale because it doesn’t roll around. But then, I work at a yarn store and we’ve got a scale set up right next to the winders and such. If you’re handwinding it, I can see that this would work fine. If you want your socks to stripe exactly, make a note of the color that starts when you begin winding the second ball. You will want both skeins to start with the same color. You may have to waste some yarn to get both balls at the same color change. I would use this waste yarn to make a pretty flower. Look at my Pattern Store for the FREE pattern, Yarn Blossom. Hi, Michelle – I, too, follow your method of dividing a ball of yarn but I tend to get confused when it is self-striping yarn. Do you have any hints for dividing a 100 gm ball of that ilk? Thanks.